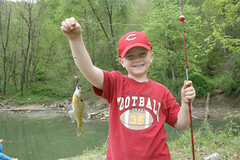 You don’t have to be an avid outdoorsman to get youth Hooked On Fishing-Not On Drugs® (HOFNOD). 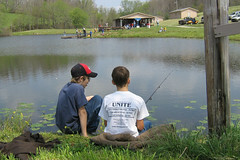 Parents, older siblings and anyone who likes to fish are encouraged to participate. Anyone can take a child fishing or serve as their mentor. A love for children is the main ingredient for success. Designed for ages 5 and up, this on-going program places caring adults in a mentoring relationships with youth to provide a fun alternative to using drugs while teaching youth fishing and conservation skills. UNITE provides free training for adult facilitators and assists coalitions with start-up costs. There is a large need for positive youth activities in Southeastern Kentucky. So many of our children do not have positive role models. Addiction is a family disease. When children are around drugs they are more likely to begin using drugs. Fishing generates communication among friends and families and provides individuals a chance to discuss problems. In addition, fishing provides a special bond between the parent/guardian and child, can offer personal challenge and prestige among peers, and is an inexpensive activity. HOFNOD, the flagship program of the national Future Fisherman Foundation, is implemented across the state with assistance from the Kentucky Department of Fish and Wildlife Resources.